In July of 1967 the Smithfield Public Health League celebrated its 55th year of operation. Established in 1912, Smithfield’s “Ladies in Blue” would visit homes throughout the town providing nursing care to the sick or infirm, as well as provide health-care information, inoculations, and advice on disease prevention. The Public health League, which no longer exists, was funded through the United Way and Community Chest, as well as any fees collected from making “house calls.” The fees, however, weren’t mandatory, and services were still provided even if the client couldn’t afford to pay. In 1967 the league was being run a volunteer board of directors headed by President Richard Connor of Greenville. Paid staff consisted of two full-time nurses, and one part-time nurse, as well as an office manager, Mrs. Eleanor Williams of Esmond. In 1966 the agency made 2,806 home visits. In 1,135 cases, no fees were charged. Another service provided by the league were children’s health conferences, which involved a ten-month series of immunization testing and shots given free of charge to children and infants under the age of six. The league helped the elderly too. In one instance, a league nurse made regular visits over a five year period to administer to an invalid husband and wife. In another, a nurse would daily go to a woman’s home to give her needed injections. USAF Airman First Class Cyril E. Crawley Jr. received the Air Medal while serving in Vietnam after flying 906 sorties in a C-123 aircraft under hostile conditions. Staff Sergeant David M. Balfour of Esmond came home from Vietnam for a thirty day leave. National Guard Airman Third Class George W. Farrelly of Greenville graduated from Air Force technical training school. U.S. Coast Guard Seaman Apprentice Gary C. Comfort completed basic training. Robert Dufresne completed his military service in Vietnam and returned home to Smithfield. He’d been wounded once, and received the military’s Purple Heart Medal. Greenville resident Lieutenant Colonel Anthony M. Marchetti of the U.S. Army Reserve was promoted to full colonel. William D. Kelley of Greenville was promoted to Airman Second Class at Kessler Air Force base. On July 29, an explosion occurred aboard the aircraft carrier USS Forrestal in the Golf of Tonkin killing 134 crewmen. After years of preparation and anticipation, the Battleship Massachusetts in Fall River opened as a museum. Today the museum complex includes two additional ships, a submarine, two PT boats, and an airplane. Town sponsored swimming lessons were given at Slacks Pond in Greenville, and Georgiaville Pond in Georgiaville. Registration was required. The Greenville Fire Company held its annual firemen’s carnival at Waterman’s Field overlooking Waterman’s Lake. (Today, housing units stand in this area.) The carnival included food, games of skill, rides, and fireworks. The Smithfield Jaycees donated a Ford station wagon to the Greater Smithfield Section for Retarded Children. Funds to purchase the car were raised in part through proceeds gained from hosting a St. Patrick’s Day dance in March. Site excavation was begun on Limerock Road for the new Raymond E. LaPerche School. New England Telephone began construction on a new central office facility on West Greenville Road to replace the aging exchange in Scituate. The upgrade was needed to accommodate the fast growing number of phone subscribers in this portion of the state. Once completed, area residents would be offered “touch—tone service” which equated to telephones with buttons instead of dials. Two new exchanges would also be added, 231, and 647. It was expected that the facility would be servicing up to 10,000 customers a day by 1977. A “Bicycle and Doll Carriage Contest” was held at the Esmond Playground. It’s unclear what the rules of the contest were, or how it was judged, but the following children won prizes: Kenneth Bessette, Mary Bessette, James Smith, Patrick Farley, Sharon Smith, Roger Hesford, Joanne Cunningham, Becky-Jean Robenhymer, Elizabeth Roberts, and Maragaret Roberts. Boy Scout Troop 3 of Greenville earned a total of 17 merit badges. The awards were presented at Camp Yawgoog. “Factory Fresh” 1967 Mustangs, Fairlanes, Falcons, and Thunderbirds, were offered for sale at a local Ford Dealership. How many remember driving one of these? SMITHFIELD, RI — March 23, 2015 — The Smith-Appleby House Museum in Smithfield, RI, will host its 42nd Annual May Breakfast on Sunday, May 3, 2015. 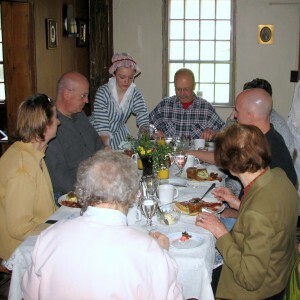 At the event, members of the Historical Society of Smithfield, dressed in Colonial garb, will host guests at the historic 18th-century home to the annual tradition of the Spring-welcoming May Breakfast. The menu of home-cooked fare will include coffee or tea and orange juice, homemade berry breads, chilled fruit cup with yogurt, crustless country quiche with sausage, johnnycakes, Muriel Mowry Appleby Gustafson’s Boston baked beans, and a surprise dessert. After the breakfast, visitors are invited to tour the rooms and exhibits of the House, which dates to 1696. It was built by Elisha Smith, the grandson of John Smith “The Miller,” a member of Roger Williams’ original party of six men who left the Massachusetts Bay Colony to settle in Providence. Expanded from its original construction as a one-room stone-ender cottage, the delicately restored 12-room historic farmhouse features beautiful cabinet work, varied architectural designs, original stencils, and furnished rooms showcasing an intriguing collection of antiques. Seating is at 11 a.m. Reservations are required; call 401-231-7363. Admission is $25 per person, which includes a self-guided tour. For more information, visit https://smithapplebyhouse.org/event/42nd-annual-may-breakfast. The House is located at 220 Stillwater Rd. in Smithfield, RI, just off I-295. The historic Smith-Appleby House is operated by the Historical Society of Smithfield, RI, as a living Museum hosting a variety of educational activities, programs, and events throughout the year. Group tours are available for schools, scouts, and other community organizations. The House and property, listed on the National Register of Historic Places, are also available to rent for private events. For more information, visit https://smithapplebyhouse.org.